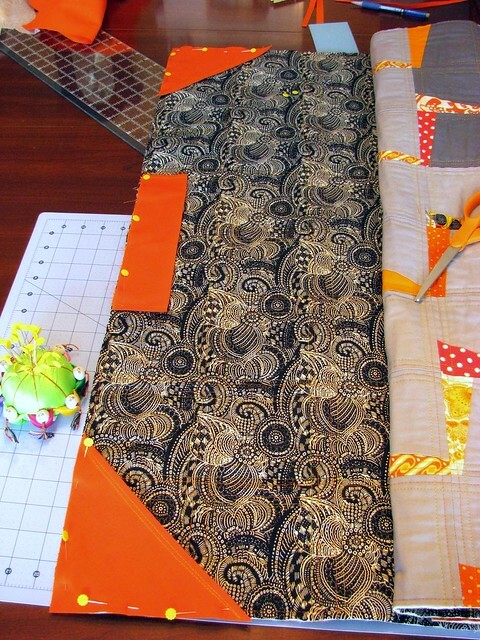 I started the new year as I intend to go through it — making quilts! So many things I sew are given away as gifts, and after the flurry of Christmas sewing I was ready to be selfish and make something to keep. I made this lightning quilt as a wall hanging for our family room to soften up a space dominated by the TV and computer screen. My eyes need a break from all the technology! 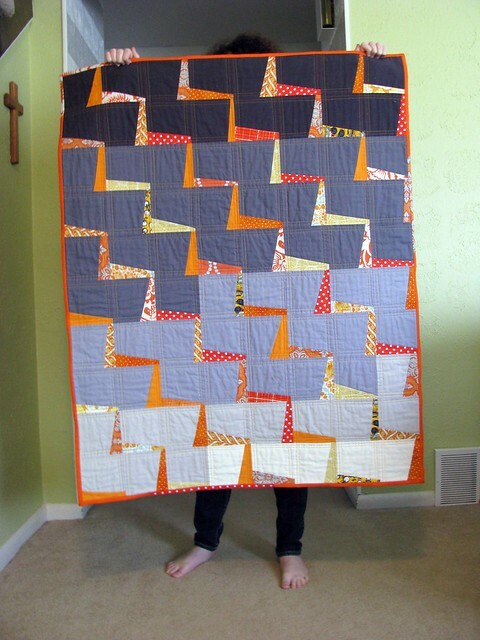 This quilt gives just enough “homemade” to relax me. If you’d like to try making one, here’s a link to the tutorial on Jenn of All Trades. It was her first tutorial and she did a great job! (Leave her a comment and tell her so if you agree!) It really is a simple design, and she’s explained it very well. She made hers as a doll quilt with 3.5″ squares, but I used 5″ squares for my larger wall hanging, with fabric strips 2″ to 2.5″ wide for the lightning. You’ll want them to be a bit wonky, so don’t stress too much about measuring those strips. Wing it, it’ll look great. Since this was meant to hang on the wall, before binding I added a couple little “pockets” in the upper corners and across the back. I might make this design a couple more times. I have some fabric from Kenya and think this might be a great showcase for it, with a solid cream background and colorful African wax prints as lightning. (It would be auctioned or sold to raise funds for MFFO.org.) This would also make a great baby quilt for a little boy, wouldn’t it? I’m picturing a dark blue sky with bright yellow lightning. Don’t be surprised if you see this again! how do you make the black trim on all your seams? Hi, Colleen! The black trim on the seams? I’m not sure what part you’re talking about. 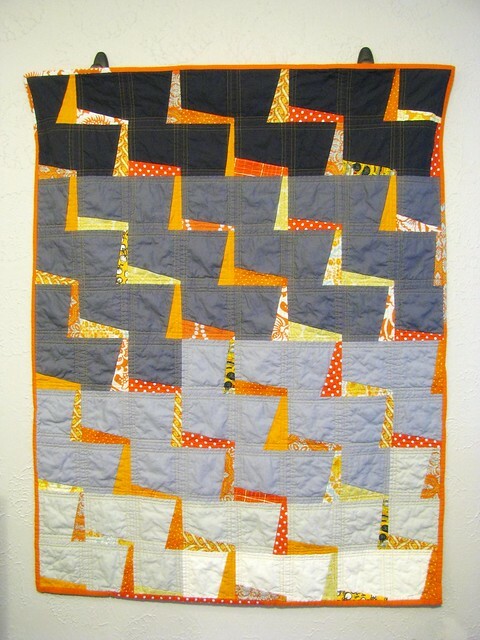 It’s quilted with orange thread about a quarter inch from all the block seams, then quilted again with yellow thread about a quarter inch from the orange thread.